Freechoice: Discover the temple of Banteay Srei and visit the Landmine Museum or explore Beng Mealea temples and the Artisans D’Angkor Handicraft Centre. Alternatively, cruise on Tonle Sap (seasonal) to view the floating villages or take a tethered balloon ride (weather dependent) to experience the spectacular aerial view above Angkor Wat. Arrive in Kampong Tralach and experience an ox cart ride through a local village and fields. Board your coach to the ancient capital of Oudong to visit the impressive pagoda and monastery to observe the lifestyle of the resident monks and nuns. 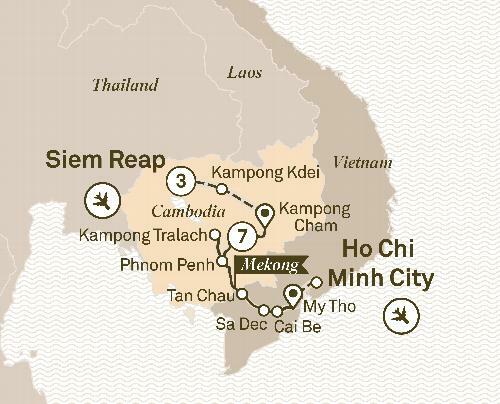 Freechoice: Journey to the Killing Fields and tour Tuol Sleng, or join a hands-on Khmer cooking demonstration. Alternatively, by Tuk Tuk explore Phnom Penh’s colonial buildings and Central Market. Freechoice: Visit the farmers on Evergreen Island and enjoy a ride in a Xe Loi. Alternatively cruise by speedboat to Chau Doc and walk through the market, visit a family-operated fish farm and cruise around Chau Doc waterfront. Alternatively visit Tra Su Bird Sanctuary. Immerse yourself in the historic town of Sa Dec and explore its lively market. Stop for tea at the home of Mr Huynh Thuy Le who inspired Marguerite Duras’ novel L’Amant.